Enchanting and nostalgic, hot air balloons capture the imagination of little ones. Think balloons & clouds as well as travel inspired items such as globes and maps. You could also use stripes to create a classic hot air balloon look or other patterns for a unique style. A Bit of Eames History! Charles Eames (1907-78) and Ray Eames (1912-88) embraced the idea that modern design was an agent of change and they believed that design could improve people’s lives. Their broad interests varied from engineering and architecture to modern art culture and design and allowed them to solve challenges with imagination, practicality and beauty. Charles Eames, Jr was born in St. Louis, Missouri. At 14 years old and while still attending high school Charles worked at a Steel Company as a part-time labourer, where he learned about engineering, drawing, and architecture. Charles briefly studied architecture at Washington University in St. Louis but after two years of study, he left the university. He was reportedly dismissed from the university because his views were "too modern”, although other sources claim that while a student, Charles Eames also was employed as an architect and the demands of this employment took their toll on his performance at university. In 1930, Charles began his own architectural practice in St. Louis. Charles Eames was greatly influenced by the Finnish architect Eliel Saarinen (whose son Eero, also an architect, would become a partner and friend). Charles moved to Michigan in 1938, to further study architecture at the Cranbrook Academy of Art, where he would become a teacher and head of the industrial design department. Together with Eero Saarinen he designed prize-winning furniture for New York's Museum of Modern Art "Organic Design in Home Furnishings" competition. Their work displayed the new technique of wood moulding that Eames would further develop to create many moulded plywood products. In the 1940’s, Charles married his second wife Ray Kaiser, a Cranbrook colleague. Ray-Bernice Alexandra Kaiser Eames was an American artist, designer, and filmmaker. Ray was born in Sacramento, California. She graduated from Bennett Women's College in Millbrook, New York in 1933 and went on to study abstract expressionist painting with Hans Hofmann. Ray was a founder of the American Abstract Artists group in 1936 and displayed paintings a year later at Riverside Museum in Manhattan. One of her paintings is in the permanent collection of The Whitney Museum of American Art. In September 1940, she began studies at the Cranbrook Academy of Art in Bloomfield Hills, Michigan. She met Charles Eames while preparing drawings and models for the Organic Design in Home Furnishings competition and they were married the following year. In 1943, 1944, and 1947, Ray Eames designed several covers for the Arts & Architecture magazine. In the late 1940s, Ray Eames created several textile designs, two of which were produced by Schiffer Prints, a company that also produced textiles by Salvador Dalí and Frank Lloyd Wright. Original examples of Ray Eames textiles can be found in many art museum collections. The Ray Eames textiles have been re-issued by Maharam as part of their Textiles of the Twentieth Century collection. In the 1950s, Charles and Ray Eames continued their work in architecture and modern furniture design. As with their earlier moulded plywood work, they pioneered technologies, such as the fiberglass and plastic resin chairs and the wire mesh chairs designed for Herman Miller. Eames furniture has usually been listed as by Charles Eames, but it would seem that Ray was deeply involved and was an equal partner with her husband in many projects. The office of Charles and Ray Eames functioned for more than four decades (1943–1988) in Washington Boulevard in Venice, Los Angeles. They Eames worked with many remarkable industrial partners and designers to create affordable, quality furniture for a wide variety of needs and locations throughout the world. 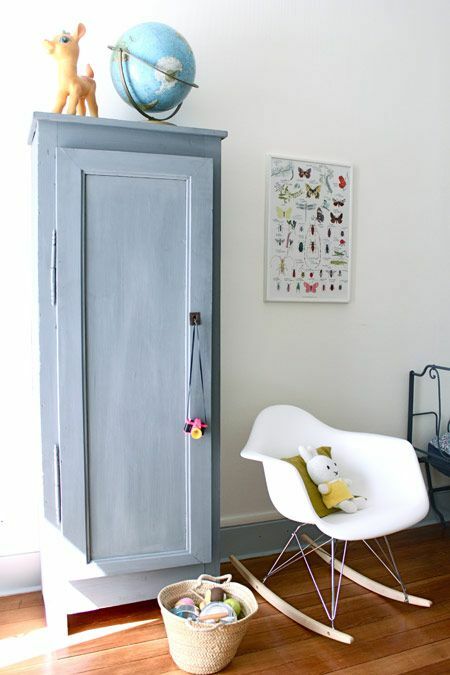 They often experimented with new ways to create furniture, working with new materials and production techniques. The corner stone of their work was an understanding of human ergonomics - design around the human form. They were particularly successful in creating three dimensional shapes using highly flexible materials that could comfortably adapt to and support the human body. The four original licensee’s for the manufacture of Eames furniture were Vitra in Switzerland, Hille in the UK, ICF in Italy, and Mobilier International in France. Herman Miller gave Vitra sole manufacturing licence for Europe and the Middle East In the 1980’s. Only Vitra still retains a licence Herman Miller Inc and they still produce these chairs today for the European and Middle East markets. As time has moved on patents, design rights and copyright protection have all fallen away, opening the way for reproductions. 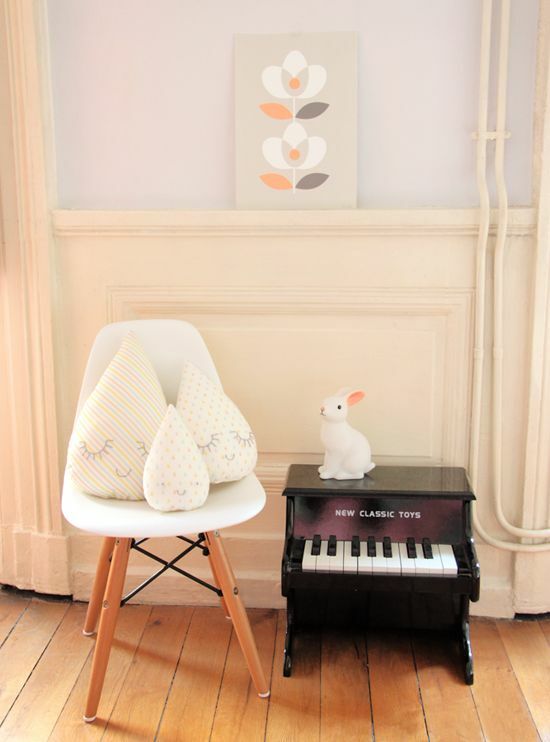 The RAR Rocker, Eames Elephant, Kids DSW, DSR chairs and Eames tables available from Great Little Rooms are reporoductions of the original furniture. 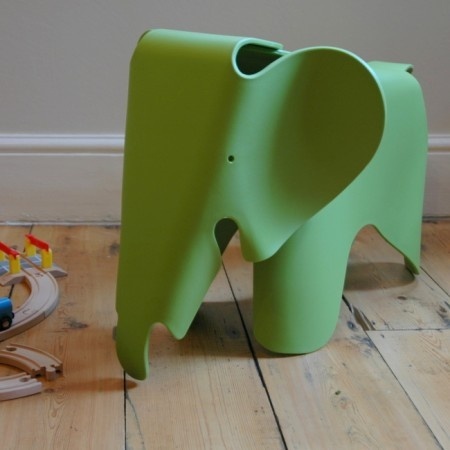 Charles and Ray Eames achieved 224 ground-breaking designs for furniture, toys such as the Eames Elephant, exhibitions, films, graphics, and architecture during their 45 year collaboration and had an unprecedented effect on 20th century design. Their focus on elegance and functionality has created designs that have endured the test of time. This is an independent overview of the background and history of the iconic Eames designs. Newborn babies sleep a lot – but not necessarily when you want them to! In the first few weeks a baby can sleep for up to 18 hours in a 24 hour period, but usually only for 3 – 4 hours at a time. Therefore you can expect some sleepless nights to begin! The following link provides further guidance on how to follow these steps and encourage good habits from the start…. ISAK is a high quality Scandinavian brand creating well designed, pattern based retro infused home accessories, with a little twist and a twinkle in the eye....they are all about beautiful happy things! ISAK wallpaper is produced in the UK from sustainable sources and there are wonderful designs to choose from…. Nova, a fabulous bold yet sophisticated geometric design to bring your walls to life! Nova Wallpaper is timeless and perfect for creating a wow factor in a nursery, child’s bedroom or playroom. Nova Dawn has fabulous hues of pink, purple, red, white and black while Nova Mist combines shades of green, blue, red, white and black. Both colour options look fabulous when used to create a feature wall and they are the perfect partner for white walls and white furniture. Penguin wallpaper, with its quirky and fun design, is available in vibrant Turquoise & White, warm Plum & White, neutral and comforting Wasabi Green & White and fabulous Silver & White. 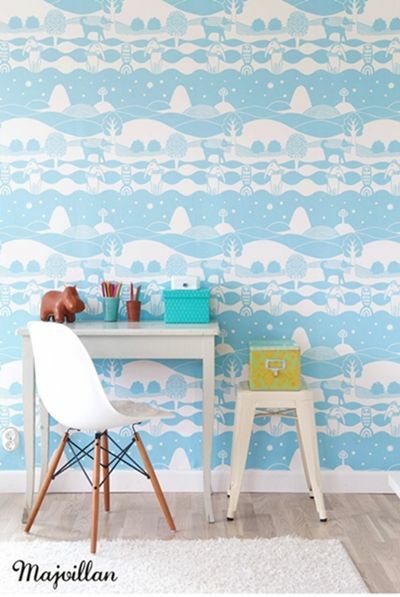 This ISAK wallpaper is sure to inspire your little ones imagination! 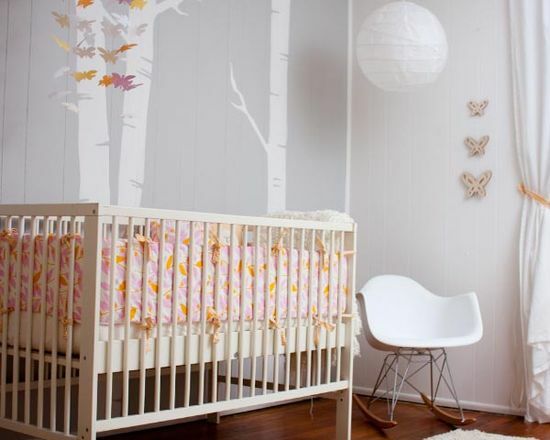 Tingleby wallpaper has a charming vintage design which includes trees, houses, flying birds, flowers and moons. It is full of fun and life, ISAK have taken inspiration from nature to create Tingleby. Available in Black & Silver and Red & Turquoise, Tingleby is perfect for a girl or boy, or for a unisex room.